Last week, we saw the first signs of northbound migration, but over the weekend we had several owls making major movements north in New England, Quebec and the Midwest. Arlington, who began moving a couple weeks ago, actually stopped and reversed course a bit in recent days in Pine County, Minnesota, not far from the “snout” of Lake Superior, and some 475 miles (765 km) from where he wintered in southern Wisconsin. On April 2 he was not far from the St. Croix River on the Minnesota side, near St. Croix State Park. Hardscrabble, who had spent his third winter in the Ottawa River valley of southern Ontario, made a huge push across Quebec in just a couple of days. Although we’re not getting constant GPS locations from him because of battery issues, we do get a current location when he checks in every day or two. On March 28 he was on his longtime territory near Kinburn, ON, but two nights later he had moved 193 km (119 miles) due north, south of Maniwaki, QC, near the Lac Blue Sea complex of lakes. By April 2 he was another 306 km (190) miles to the northwest, midway between Val-d’Or and Lake Abitibi. That’s pretty much right along the same route that he took when he headed north in 2016, south that fall, and north again in 2017. 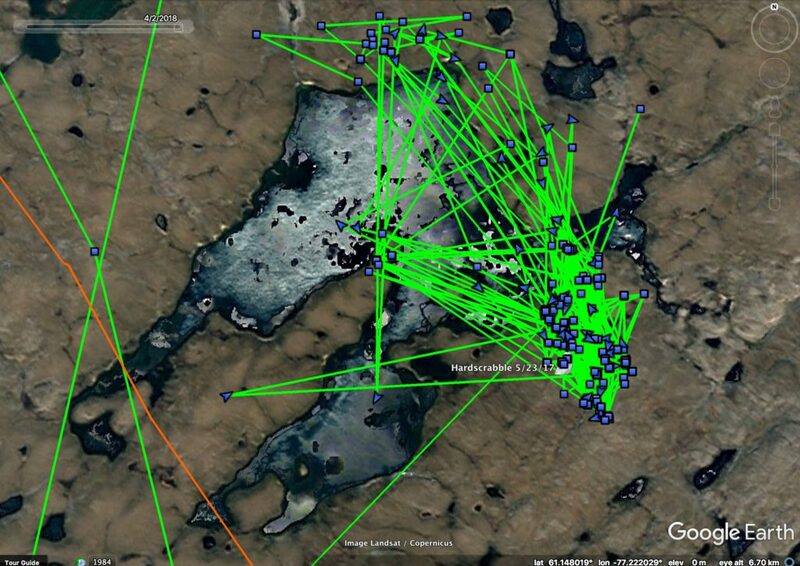 At the same time, he’s continuing to give us backlogged data while still storing fresh GPS locations — the trouble is, his battery browns out after just sending a few dozen data points, so we keep falling farther and farther behind. The solution would be to remove and replace the faulty unit, which we tried repeatedly to do this winter without success. For now, we can just hope to find him again next winter and have more success trapping him. 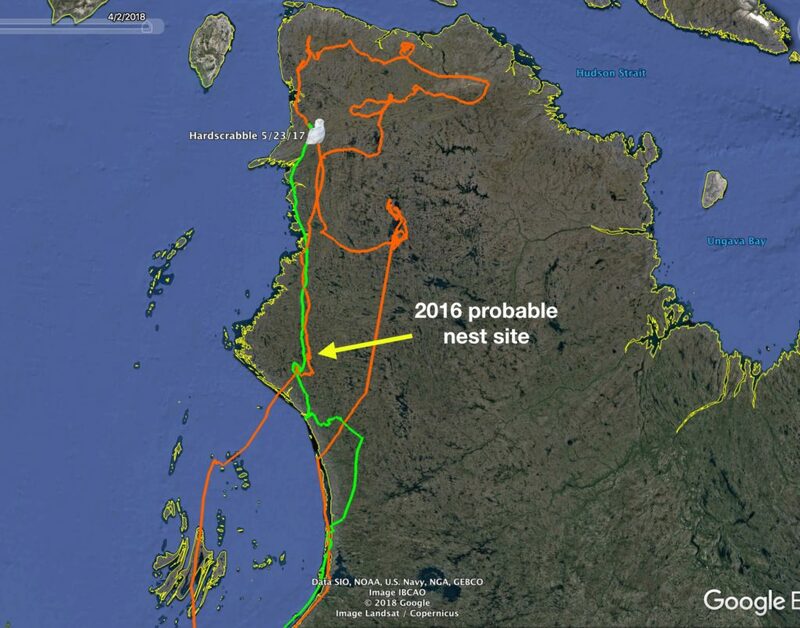 But with his old data uploaded through May 23, 2017, it seems pretty clear that he had again settled down on a very limited territory in northern Quebec — likely a nesting territory, though the data signature for a male like Hardscrabble is less clear-cut than for a female that spends a lot of time incubating. Still, it certainly seems as though he was beginning the nesting process. Over in New England, Norman Smith’s been increasingly concerned about Logan, who after Norman relocated her from Logan Airport has spent the last two months in heavily urban areas just a few miles from downtown Boston. At least four other snowy owls have been picked up dead in that region, and toxicology tests suggest they died from rodenticides. While there were plenty of ducks on the nearby Mystic River, there was no sign from Logan’s tracking data that this adult female was hunting them regularly. So we all breathed a little sigh of relief when Logan picked up March 31 and began a rapid flight up the coast. In one night of travel she moved 170 miles (275 km) from northern Massachusetts to the midcoast of Maine, finally stopping north of Belfast. On April 2 she was a bit further inland, at the Bangor Airport. When I contacted our colleague Adam Vashon at Maine Wildlife Services to let him know, he said they’d gotten a call earlier in the day about an owl at the airport, and a WS agent had tried to catch it without success. No wonder; Logan’s been trapped at least twice in the past by Norman, and may be getting wise. Hopefully she’ll push on from the airport soon — as a breeding-age adult, she has a powerful pull to the north at this time of year. None of the other owls — most of which are juveniles, several years away from breeding age — have shown a lot of northward movement. On the mid-Atlantic coast, Lenape has moved north out of Virginia into Maryland on the Eastern Shore, but this bird has basically never stopped flying all winter, so it’s hard to say if this was migration or more of the same. Farther north, Island Beach has been back and forth again across the mouth of Delaware Bay, and last weekend was up on the huge saltmarshes along the northern bayshore on the New Jersey side, as well the town of Fortescue. Sinepuxent is still in the Atlantic City/Margate area, mostly way back in the marshes. At last report on April 2, Hilton was about 6.5 miles (10 km) off the southern shore of Lake Erie, near Dunkirk, NY. Sterling was off the grid this week, as was Gichigami. 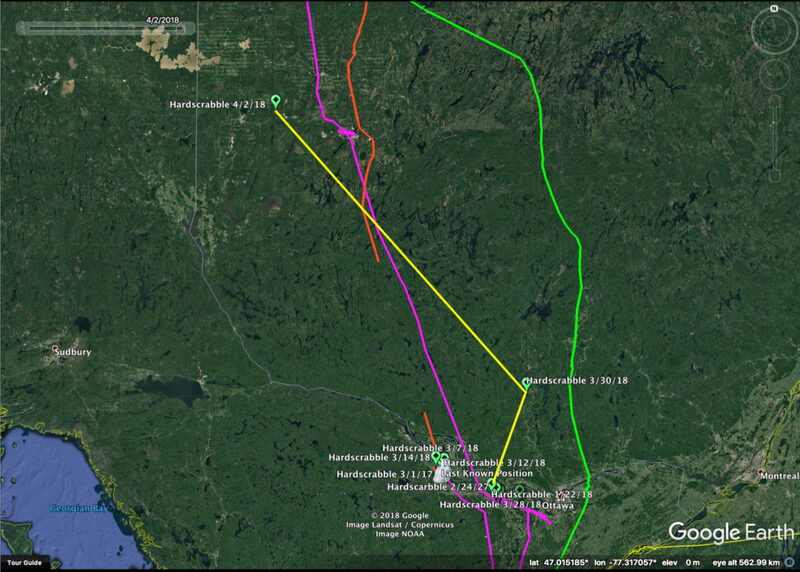 Stella and Emerald are still in place on Amherst Island, although Emerald made her first flight across to the mainland all winter, which may portend growing restlessness. No movement from Wells or Chickatawbut in Quebec, or Pickford and Pennington in the Michigan Upper Peninsula. 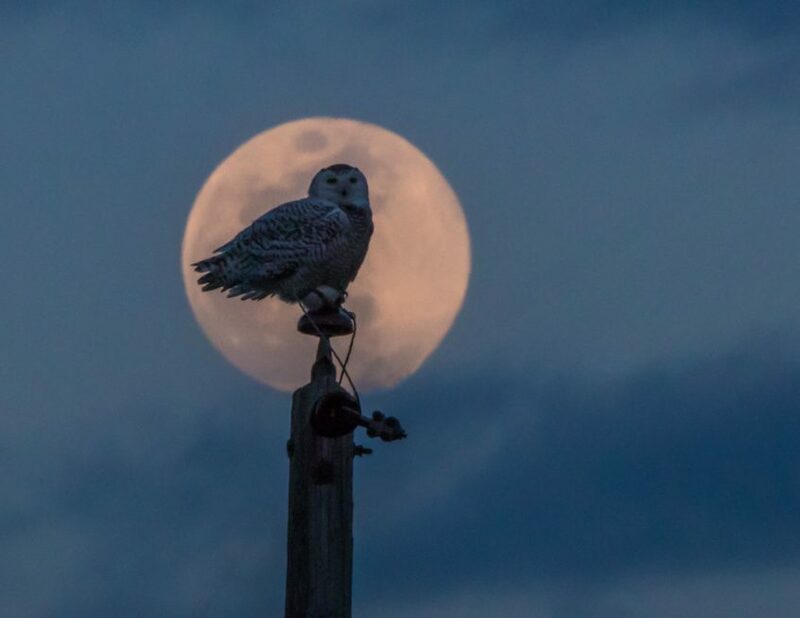 Austin, Bancroft and Straubel are still divvying up their 8-square-mile (20.5-sq.-km) area in central Wisconsin, where photographer Tom Koch got a great shot of Straubel framed by a full moon the other night. Out in the Dakotas, Pettibone is hanging tough on his winter territory, while Ashtabula looped south a fair bit into Emmons County, North Dakota, about 30 miles (50 km) east of the Missouri River. I travelled to see the juvenile male in Taylor County Ky. last week (which is still there) and I am wondering …. do juvenile males feel the urge to travel back north to breed as their older elders do ? I fell in love with the Taylor Snowy and wish he had a tracker so I could follow his travels . Have you wonderful people at Snowstorm considered tracking some of the Snowys that travel farther south ? Mary — Thanks for the great questions. We’ve definitely seen as difference in spring migration timing between adults and juvenile snowies, like the Taylor County bird (which based on photos that show the open wings and tail is, as you say, a young male). No one knows the minimum age at first breeding for snowy owls, though it’s thought to be at least four for most males, so no, they don’t have pressing business up north, and some of them linger pretty far south into April and May…some even longer. As for tracking snowies at the southern limit of their irruptions, we’ve been asked about that since SNOWstorm started four years ago — some folks wanted us to tag an owl that made it to Jacksonville, FL, that winter. Others have contacted us this winter about snowy owls in Oklahoma and Texas. We’ve been reluctant to put transmitters on those individuals at the extremes, though, because we assume those birds are more likely to be under greater physiological stress simply because of the distance they’ve flown and the much warmer conditions in which they find themselves. If that’s true — and many or most of them may be in fine shape — we’d rather not add to their burden of making it through the winter and getting back north again. On the other hand, we’re making some assumptions about those southernmost owls in the absence of any real data, and perhaps with further reductions in the size and weight of transmitters we might feel more comfortable about trying, and rethink that approach. I went to visit a friend on Amherst Island Easter weekend because another friend said they had seen 48. F. Y. I. , I found 8 & photographed them. The snow is almost gone in the fields and I hope they are heading home. 8 snowys on Amherst Island photographed.